A man who went to a fancy dress party in Ryton-on-Dunsmore dressed as Robin from the Batman series is being sought by police after a serious assault took place. A 26-year-old man was attacked in The Sports Connexion on Leamington Road, Ryton-on-Dunsmore, at about 11.45pm on Friday December 7. The incident happened following a verbal altercation between two groups who were attending separate parties at the venue. The man police would like to speak to was at a fancy dress party dressed as Robin from the Batman series. Police believe he might have information that could help with their investigation. The victim sustained significant head injuries in the incident. Detective Constable Steve Mobbs from Warwickshire Police CID said: "There were a lot of people at the fancy dress party so I'm sure someone will recognise this man. I'd appeal for anyone with information to come forward. "If you recognise the man in the photo, please get in touch as it is essential we speak to him as part of our enquiries." Anyone with information should call 101 quoting incident 492 of December 7. Alternatively, information can be provided anonymously to the independent charity Crimestoppers on 0800 555 111. 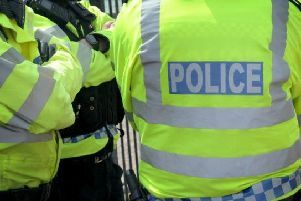 An 18-year-old man from Rugby and 19-year-old man from Wolston previously arrested on suspicion of assault in connection with the incident are currently on police bail.